Can You Outrun Mental Health Issues? – Mindfump! During my 15 years or so of mental health issues I have done many things to try and avoid, change, take control and cure myself of my issues. The things I do are often misinterpreted as things like ‘he loves to travel‘ or ‘he just loves exercise‘ or ‘he enjoys other cultures‘. Now that is not to say those things are not entirely true but it’s never the reason I do the things I do. For instance, the first time I tried to outrun my mental health was not by using my legs but by moving to a new city. I lived in the north of England in a very small, insular town which quite literally suppressed ambition, creativity and change. My idea was that it was the town’s fault. It was to blame. So I left and this pattern continued for the next 10 years. I would keep running. I moved from city to city, country to country, hoping for change. It seems obvious to me now but I was changing everything apart from myself, my perspective, my views on myself and my attitude to my issues. I did truly outrun my mental issues once though. It was 3 years ago when I was living in Finland. I had decided – with no prior experience – to enter an Ironman Triathlon. It is almost 4 km of swimming, 180 km of biking and then running a marathon, all in one day. I don’t have a bipolar disorder but occasionally I have periods of mania in which I feel I can do anything and achieve anything. Only for everything to snap into focus and realise that I have actually signed up to do the longest mass triathlon in the world – sh*t.
To my surprise I took it very seriously. Having a goal, even a huge one, gave me a focus and a drive I’d never had before. 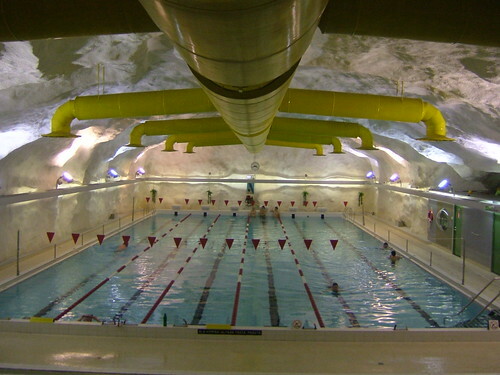 I would wake up at 5am to go swimming in the deepest underground swimming pool in the world in Tampere, Finland. It was winter at that time and temperatures would be below -20. There would also only be 2 hours of sunlight per day. Again to my surprise I kept waking up and doing the training. This is when I noticed the change mentally. My demons ceased to be demons and became supporters. Encouragement was the new order of the day. Everyone and everything in my head was now aligned to doing this thing. There was no daily mental abuse, no depression, no anxiety. I was fit, strong and mentally all in one place. i was eating well, sleeping well and in a strict routine. The days and weeks were very long. As training went on I moved to another new country – my current country – Austria. My training became harder and harder, and longer and longer. Working full time and then fitting in 25+ hours of training. I was of course exhausted but I could deal with the physical pain in a way I cannot deal with mental pain. It was as if the mental pain had completely been absorbed into the physical. This was 7 months of hard training. 7 months of tedium – for instance I would spend approximately 10+ hours a week on a gym bike staring at a wall with no music, no TV, just my thoughts. It is a happy, calm, mental illness free time of my life but its not a happy ending. Before the big day I had been having pain in my shins – shin splints. 3 days before the event I saw a physio who told me I had a stress fracture and that I shouldn’t do any running or anything strenuous. Naturally I ignored this advice and finished the triathlon. Two things did happen after the triathlon though. The first was that I stopped all exercise immediately. I felt I deserved a rest and this culminated in a prolonged period of depression. One where 6 weeks later I was left sobbing alone in a hotel room in Tokyo, Japan – a place I had never been. I didnt want to see anything, I didnt want to visit anything, I just wanted to stay in my tiny hotel room. This behaviour continued as I moved to Beijing, China. The second thing that happened was that my shins did not recover. I knew that exercise was saving me mentally but I could not run, I could barely walk. In fact, 3 years later I still have pain when I walk. Recently I saw a sports injury specialist to discover that I now have a double stress fracture in my left leg and a stress fracture in my right. Medical advice; dont walk for 4 months. Failure to do so will result in two broken legs, surgery and lots of rehab. So I outran my mental issues… but they have caught back up. I now cannot run, and can barely walk, intense exercise which saved me previously seems so far away. I now feel like I am relying too much on the prospect of training again one day, like – everything will be OK once I can run again, and maybe it will.. Above all else I think physically exercise is essential for tackling my demons. I would highly recommend it to anyone. Sign up for anything. Whatever you think is tough, 5k run, 10k run, a marathon, a triathlon. Whatever it is, do it. I would love to see if it had the same effect on you. But if you feel any pain – get it checked out early! Have You Fallen Into The Choice Trap? Reblogged this on Life as it happens to be.